Fiume, abandoned by Austrian troops, was taken by Croatian soldiers on 23 October 1918. On 27 October, the town was placed under the control of the South Slavian Commmittee of Agram (Zagreb). On 4 November, an Italian ship seized the town and installed an Italian committee, replaced a few days later by an Interallied Committee; a French base was created. Several incidents happened between Italians and French, and between Italians and Serbs as well. Yugoeslavia and Italia claimed the control of the town, a dispute that was not resolved in the peace treaty signed on 2 September 1919. The poet Gabriele d'Annunzio, leading a corps of Italian volunteers, took Fiume on 12 September 1919 and created an independent goverment called Carnaro Italian Regency - Reggenza Italian del Carnaro. Under Yugoslav pressure, Italy blocked the town; the Treaty of Rapallo, signed on 12 November 1920, recognized the "perpetual independence" of Fiume. D'Annunzio declared war to Italy on 3 December 1920; Italian warships bombed the town and d'Annunzio left Fiume. A provisional government was set up Free State of Fiume - Stato Libero di Fiume) and an agreement was signed in June 1921 between Yugoslavia, Italy and the Fiume government. On 6 October 1921, an elected government was established under the leadership of Ricardo Zanella. On 3 March 1922, the Italian nationalists took the town and the autonomist Zanella was deposed and replaced by Giuriati; Fiume formally kept its independence. Zanella ruled a governemnt in exile from Yugoeslavia. In 1923, the Italian troops took Fiume. The Treaty of Rome, signed on 12 January 1924 with Yugoslavia, recognized the Italian annexion, some zones being assigned to Yugoeslavia. Fiume was returned to Yugoslavia by the Trearty of Paris, signed in 1947, and renamed Rijeka. The flag of Fiume had horizontal stripes of karmesinrot - goldgelb - kobaltblau, that is, crimson (dark red) - golden yellow -cobalt blue, "translated" into Pantone: ca. 193/200-116-300. I do not know the status of the flag up to 1918, but I believe it could have been used only as a town flag. It was the official flag of the Free State of Fiume from 2 February 1921 to 16 March 1924, and there was a version with arms. The colours of the flag derive from the arms. The war ensign was designed by Gabriele d'Annuzio, as shown in a drawing dated 27 August 1920 kept in the Rome National Library. The use of the flag is authenticated from contemporary sources. The gonfanon was created by Gabriele d'Annunzio as a vertical flag, with, in the middle, a snake eating its tail, a symbol of eternity. The snake encircles Ursa MAjor's stars; on both sides there is a scroll with the motto "QUIS CONTRA NOS?". In the lower part are the two flags of Italy and Fiume. A photo shows a flag with a different design (source). After the annexation of the town of Fiume, the Italian rulers organized in 1925 the Carnaro Province (Croatian, Kvarner). The province was granted a coat of arms and a gonfalon by King Victor-Emmanuel III in 1929. The beautifully coloured armorial patent, signed both by the King and Mussolini, is preserved in the Rijeka Museum. The coat of arms is: "Per pale, 1. Sable Roman fasces palewise or, 2. Gules seven mullets of five or arranged as the Ursa Major". The shield is crowned with a provincial crown with an olive and an oak branch. The coat of arms was also the main feature of the seal granted at the same time, and undoubtedly, used henceforward. The gonfalon is a blue silk hanging banner with three fringed and tasselled tails and bordered with golden ornament along the other three sides, containing the coat of arms in the middle and the name of the province in an arch above. There is no evidence that the gonfalon was actually produced and used, however, beside the coloured images of the coat of arms and the gonfalon in the armorial patent; there are several ink drawn construction sheets in the Museum collection. 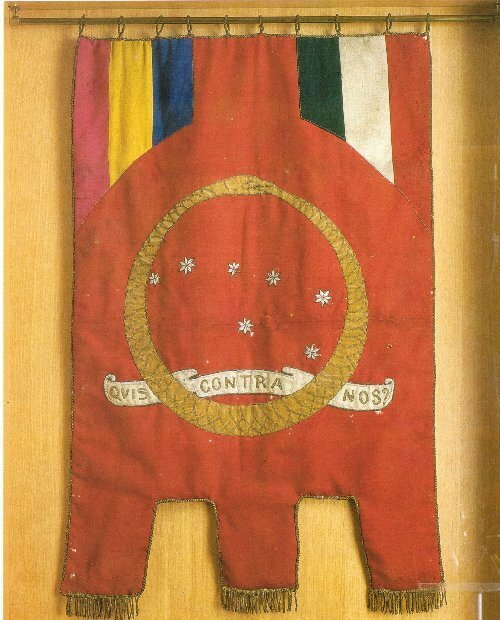 These show the flag with all the dimensions needed for the production, however the coat of arms included in the design is somewhat different - including also a red chief that contains golden fasces between an oak and an olive branch wreath tied together with a tricolour ribbon. This version of the coat of arms must have been from a project phase. The coloured drawings are signed by Luigi Bangori Machiavelli (? ), presumably the designer. The flag was adopted on 28 September 1929 and abandoned on 8 September 1943.